So I’m a Mac user by trade and unless I’m on client sites or demo’ing Lync i undertake all my day to day consultancy work on a Macbook Pro. I know some will say that within office for Mac and particularly the Mac Lync client its rather undercooked in terms for functionality. For me though once you get your setup correct i can work without issue and mirror a Windows counterpart. My issues have been ranging from the lync client simply not recognising the headset, or part way through a call i would loose voice either inbound or outbound, or even though the headphone was seen and enabled within Mac OSX system preferences no audible tones could be heard. This morning i thought i had to get this fixed and with a little help from my friend ‘Google’, and also a Modality systems colleague Justin Morris (www.justin-morris.net) the answer and resolution is out there and available if you look closely enough. In August 2012 Microsoft did in bring an update out for the Lync for Mac client. The problem is though the ‘check for updates’ within the Lync for mac client does NOT pick this update up14.0.3 AND you have to request the update from Microsoft support. Once you set this all is good again. 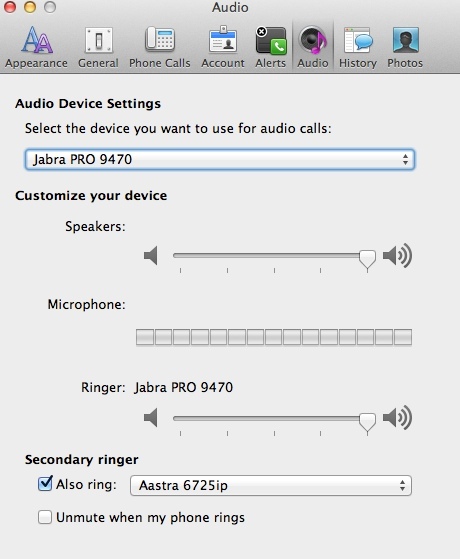 You no longer have the faff about in systems preferences to set your audio.